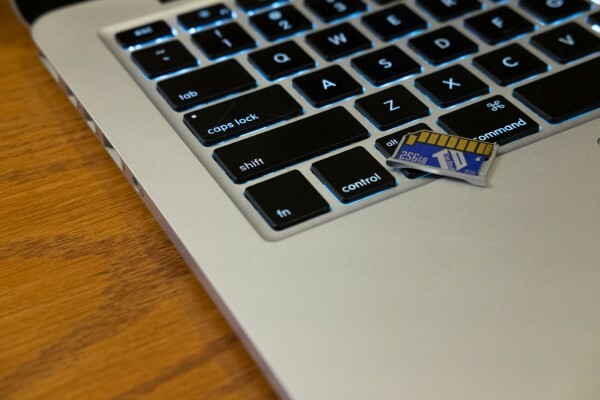 How much storage does your laptop need? The question nags as I prepare to review TarDisk Pear flash memory expansion. The doohickey is available in 128 or 256 gig capacities for either MacBook Air or Pro. It fits neatly and snuggly into the SDXC card slot, which is required; color and finish match, too. Windows users must look elsewhere, though, and many may be glad to. The tech lists for $149 and $399, respectively. But, hey, the Apple fan club is accustomed to paying more for everything. I will test TarDisk Pear on my 13-inch MacBook Pro with Retina Display, 3.1GHz Intel Core i7 processor, 16GB RAM, and 256GB SSD. I recently, and unexpectedly, filled up the hard disk with photos and podcast raw recordings. (Hehe, using Chromebooks for so long spoiled me and my awareness of such things.) Doubling storage, particularly with San Diego Comic-Con coming in 14 days, could prove useful for editing audio, pics, and video on the laptop. But is it necessary or contrivance? Consider Chromebook Pixel LS, which my wife adores. The laptop also packs i7 processor and 16GB RAM but only 64 gig SSD. But with Google cloud services—Drive top of list—tightly tied to the operating system, the capacity is more than enough. Files are stored on remote servers, from where most apps run in Chrome. Recently, I primarily use the 12.9-inch iPad Pro, with Apple A9x processor, one-quarter the memory of my MBP, and half the SSD capacity. The tablet feels as fast as the laptop, and storage so far is more than sufficient; mobile apps consume less space than their OS X counterparts and many connect to cloud services. Do I need another 256GB, or do you? There's a strong case for anyone using MacBook Air or Pro with 128 gigs. TarDisk Pear could double capacity for $149, provided you absolutely need what the flash memory card promises: Seamless, contiguous storage, That's right. The add-on doesn't mount as a separate disk but presents with Mac HD as a single volume. That's slick, if my testing supports the claim. Here's the thing: You can store content in the cloud, but OS X (soon to become macOS) apps primarily run locally. Monsters like Adobe Photoshop, Apple Final Cut Pro, or Microsoft Office fill up a 128GB SSD damn fast—much more so when editing and processing digital content. Working with an external drive is much cheaper but means carrying something more. I use the LaCie 4TB Rugged Mini USB external hard drive. Amazon sells for $219.99, which works out to less than a penny per megabyte. The larger of the TarDisk Pear pair is $1.56/MB and the smaller $1.16/MB. The cheapest choice for integrated, easily-installed storage is point of sale. Apples sells the configuration of Mac I have for $1,999 new. The kit is $200 more for 512GB, which is final capacity that TarDisk Pear promises for $399. I never had the option for more, because I bought my Mac used from an Apple reseller specializing in refurbished corporate computers (meaning no build to order). I spent about $600 less than new, including three-year AppleCare warranty that expires in 2018. Would I spend $400 more to double memory now? My review will answer. All the while, I will reassess my needs and try to come up with a manageable matrix for conceptualizing storage options. Consider the honking LaCie drive, which is plug-and-play. That's easy enough but also acts as an anchor. TarDisk Pear slips in the card slot and disappears, but installation requires that I disable file encryption beforehand. FileVault can come back, but not Boot Camp—so dual-booting Windows 10 is out. Once installed, the storage add-on can't be removed without corrupting the OS X volume, which means I can no longer use the SDXC slot for my camera's SD disk. I'll give you the lowdown on how well this process goes and my impressions of performance and other matters. Hey, that's what reviews are for. All the while, I will ask myself the storage capacity question, which I encourage you to answer in comments. Other readers can benefit from your personal solutions. So, please, let's have `em.